Where does nuclear energy come from? 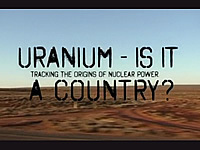 This documentary takes a look at the footprints of nuclear energy. The Olympic Dam uranium mine in Australia is run by the multinational corporation BHP Billiton. Uranium mining is very lucrative and the demand for it is booming. The spokesperson for the Australian Uranium Association talks of a bright future. He claims that Australia has the potential for 15 to 20 new uranium mines. An indigenous resident speaks of the impact the mine has on the environment in which he lives. On the other side of the world, nuclear energy is a subject of debate. A french researcher measures radiation from nuclear sites and uranium transportation. In Germany the state secretary for the ministry of the environment points out that nuclear energy is not suited to stop climate change.